FOX News confirmed today that the US ran guns from Benghazi to Syria before the attack on the US consulate on September 11, 2012. The US Ambassador to Libya and three others were killed in the terrorist attack. The Obama administration was running weapons to Syria. FOX News reported Monday that the US was sending guns to Banias and Borj Islam, Syria before the Benghazi terrorist attack. The memo also tied the attack to 9-11… No discussion of a demonstration or anti-Mohammad video. US officials were aware that weapons were being shipped to Syria by the Port of Benghazi. 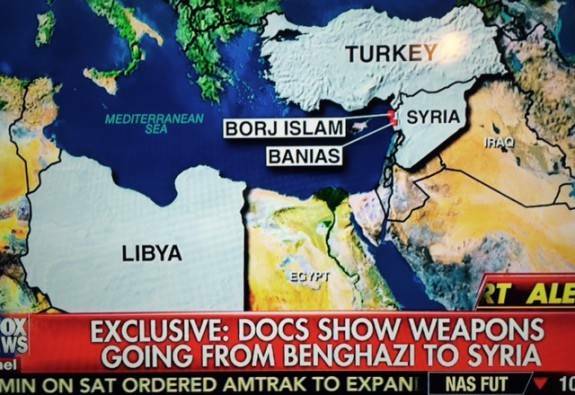 The US was in fact running guns from Benghazi to Syria when the annex and consulate were attacked. Hillary Clinton said she did not know about the program while testifying under oath. Sen. Rand Paul: My question is, is the US involved in any procuring of weapons, transfer of weapons, buying, selling anyhow transferring weapons to Turkey out of Libya? Hillary Clinton: To Turkey? I’ll have to take that question for the record. That’s, nobody’s ever raised that with me. Sen. Rand Paul: It’s been in news reports that ships have been leaving from Libya and that they may have weapons. And what I’d like to know is, that annex that was close by, were they involved with procuring, buying, selling, obtaining weapons and were any of these weapons being transferred to other countries? ANy countries, Turkey included? Hillary Clinton: Well, Senator you’ll have to direct that question to the agency that ran the annex. And, I will see what information was available. Sen. Rand Paul: You’re saying you don’t know? Hillary Clinton: I do not know. I don’t have any information on that. Rand Paul accused the Obama administration in January 2013 of running guns to Syrian rebels.